Waikoloa Beach Villa with 2 Bedrooms, 2 Bathrooms, Swimming Pool, BBQ Grill, Covered Lanai, Close to Beaches & More! 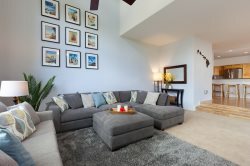 This tropically inspired Waikoloa Beach Villa is designed to maximize the 1,2009 square feet of luxury living spaces and features two bedrooms, two bathrooms and accommodates up to six guests. The Waikoloa Beach Villas is a low-density community of 120 units on approximately 20 acres. Beautiful, manicured grounds have two swimming pools, two hot tubs, and one fitness room for your relaxation and enjoyment. Multiple living zones work well whether the guests are a couple or a family. The contemporary living room is evidence of a modern yet elevated taste: the clean lines of the leather sofas and accent tables all tie together. Open and inviting, the living room flows into the dining area and kitchen making entertaining a breeze. The kitchen comes fully-equipped with high-end appliances and the dining table seats six with four more seats at the breakfast bar. Just off the dining area is an outside lanai that holds a gas grill and a dining table with seats for four. The master suite offers a king-size bed, flat screen TV and a beautiful bathroom with a walk-in shower and a deep soaking bathtub. The guest bedroom features a queen-size bed, flat screen TV and is close to the main bathroom. This unit also includes; basic cookware, dishware, drinkware, coffee maker, blender, washer/dryer, hairdryer, bed and bath linens, iron, air-conditioning, wireless service, 1-car garage, and basic cable TV. There is plenty of beach gear like chairs, boogie boards, cooler and umbrella as well as beach towels for your use. All our vacation rentals include a basic “start-up supply” of: laundry detergent, garbage bags, kitchen sponge, liquid soap, dishwasher tabs, paper towels, toilet paper, shampoo/conditioner, small bar soap and salt/pepper. Cooking oils and spices are not provided. Once the startup supply runs out, guests are on their own to purchase additional supplies if needed. Cleaning solvents are not supplied. One of the best located complexes in Waikoloa Beach Resort is the Waikoloa Beach Villas. Ideally located within easy walking distances to the Queens’ MarketPlace, Kings’ Shops, A Bay Beach, Hilton Waikoloa and the Marriott hotels. If you are sticking close to home...enjoy the resort style pool, property fitness center, or cook dinner right on your private lanai with your outdoor summer kitchen. Spacious condo, nice pool, spa, and grill, for a great price. All make for a relaxing, enjoyable vacation. The photos don't do this place justice - all of the furnishings and the property itself are top quilty and next to new. All of the lounge chairs recline and the TV in the lounge is huge. All of the furniture was comfortable and the main bedroom is huge and very grand. The view over the golf course is beautiful and the pool is quiet and serene. The property has excellent proximity to beatiful beaches (A Bay, Hapuna and Beach 69), as well as shops. There is a supermarket jet across the road that sells ready meals so we saved a lot of money eating in. We would definitely come back here, in fact we were planning the next trip before we even left... That has to say something. Everyone contacted were very positive and eager to help. Very good experience. It makes a vacation truly relaxing.